Summer tax collection is winding down, if you were unable to pay your tax before October, 2017 you can still pay them at the Township Office, until February 28, 2018. You will need to add 1% interest per month, starting with October the interest would be 2%. The next tax statement will be mailed the first week of December 2017. They are due by February 28, 2018 after that date they go to the Chippewa County Treasurer as delinquent. 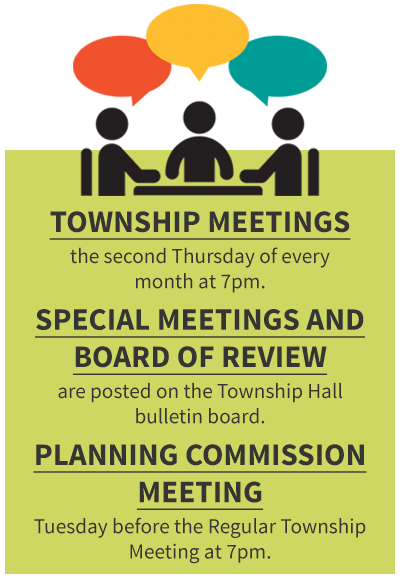 We have had a busy year at the township, an audit, cemetery, etc. in addition to the normal operation. If there should be a power outage this winter, the township hall has a generator so if you need somewhere warm,a place to cook and water, it is available. Always be kind to your neighbors. Here we are back to Fall once again.